In the last few days Maggie Fox, of Reuters, has revealed how the humble cow’s stomach has yielded an important secret to researchers which, it’s hoped, will help farmers produce biofuel (ethanol) which can be easily turned into biodiesel, more efficiently in future, and also from non-food crops. These non-food crops would be grown on marginal land not suitable for food crops. The secret which is referred to is the identification of the precise enzyme-producing microbes that decompose grass into the products of “rotting” which are needed to create energy. The method used by researchers to find the biofuel producing enzyme, is called genetic sequencing. Samples were taken directly from cattle rumen, which is the organ in which the fermentation and breakdown of the grass they eat takes place. 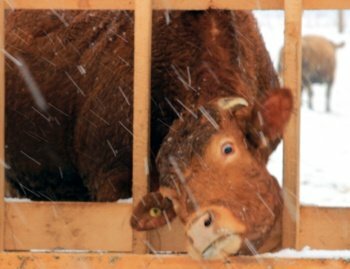 They were then subjected to a gene-sequencing technique called metagenomics to find the very special bacteria thrive in the airless environment of the cow’s stomach and release the enzymes that produce ethanol. These we are told, were isolated. The next step was identifying exactly which enzymes the bacteria use to carry out this special chemical conversion very efficiently. These were singled out, and their chemical structures found. Enzymes, once known, can often be produced synthetically and can then be used on a large scale to perform tasks carried out before, but much less efficiently by other chemicals. The best known example of mass use of an enzyme, which just about all of us use each week, is biological washing powder. In a similar way, the enzymes we use to wash our clothes were also found in nature first. They now routinely remove stains from our clothes far more effectively, and at lower temperatures, than the soap and detergent powders they replaced during the 1970s. So, this enzyme discovery may have a huge benefit, just as that previous “stain removal” enzyme discovery did. The big hope is that due to this discovery, not only will the conversion process become more efficient, but the efficiency gains bring a change to the crops used. The big problem with biofuel (like biodiesel) so far has been that the rapidly rising production of biofuel has reduced the available crop for consumption as food. This in-turn has been associated with world food price rises. The researchers are already hoping that the energy in, for example, switchgrass can be used. Switchgrass is most often found on marginal land which is not suitable for food crops. If these developments are successful, the world’s future population can eat, and will still be able to drive their cars, and cook and heat their homes in winter. This, even after all the fossil fuel based oil we depend upon today has been used up.